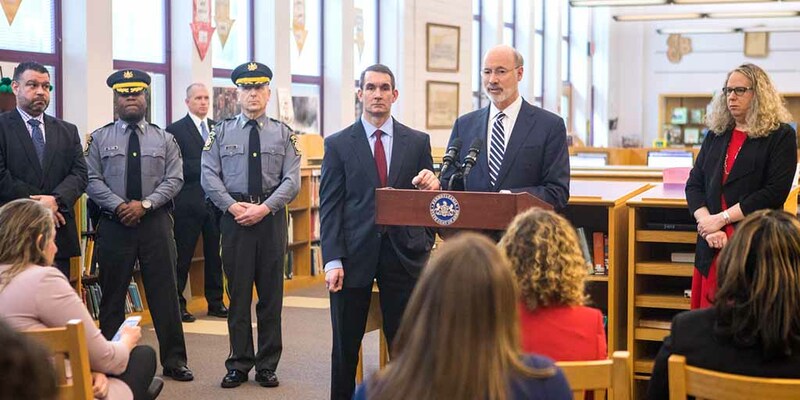 Harrisburg, PA – Governor Tom Wolf and Auditor General Eugene DePasquale today announced the common themes that will be addressed in an upcoming report from the Pennsylvania School Safety Task Force, created by Gov. Wolf and the Auditor General in February after the high school shooting in Parkland, Florida. This announcement comes following the passage of Gov. Wolf’s 2018-19 bi-partisan budget, which includes $60 million for a School Safety Fund to strengthen security and mental health services in schools. Appointed by the governor, the task force held a series of six regional roundtables at schools from April through June to listen to students, parents, school officials, school nurses and other health care professionals, law enforcement, education organizations and community members about their ideas to improve safety and security. “I commend the work of all those who participated in the task force – especially the students – for providing their incredible perspectives,” said Governor Wolf. “It was clear in every region of the state that keeping our schools safe requires a holistic approach focused on students and our communities so that our classrooms can be focused on learning. Read the full content of the initial findings here. Other members of the task force included vice-chairs Derin Myers, Acting Executive Director of the Pennsylvania Commission on Crime and Delinquency; Mark DiRocco, Executive Director of the Pennsylvania Association of School Administrators; Bonita Allen, President of the Pennsylvania Parent Teacher Association; Judy Morgitan, Immediate Past President of the Pennsylvania Association of School Nurses and Practitioners; and Dolores McCracken, President of the Pennsylvania State Education Association. Each meeting included over 40 community participants invited by the vice-chairs to create a discussion focused on the needs of that region. Several members of the Wolf Administration provided support to the task force, including Homeland Security Director Marcus Brown, Education Secretary Pedro Rivera, Health Secretary Dr. Rachel Levine, Labor & Industry Secretary Jerry Oleksiak, Acting State Police Commissioner Colonel Robert Evanchick, and Human Services, Office of Mental Health and Substance Abuse Services Deputy Secretary Lynn Kovich. The task force plans to release its final report before the start of the 2018-19 school year. The 2018-19 budget, which the governor signed last week, includes the newly created School Safety Fund, a $60 million investment to help individual school districts meet their local needs by funding a wide variety of programs aimed to keep students and teachers safe. The funding will be awarded to schools in the form of grants to cover a numerous expenses and programs, including physical building upgrades, security equipment, violence prevention education programs, teacher training, alternative education programs, and special and individualized mentoring programs. Also included is a new program that will allow the Pennsylvania State Police to create three regional Risk and Vulnerability Teams to help schools undergo security and safety assessments. And, the state will be creating a confidential, statewide tip line that will allow students and teachers to anonymously report potentially dangerous situations or individuals that involve schools. “This new money aligns with the themes we heard during the task force and will help address the needs of school districts by providing an immediate infusion of funds, so our schools can increase security while creating programs that meet the safety needs of their schools and communities,”” Gov. Wolf said.